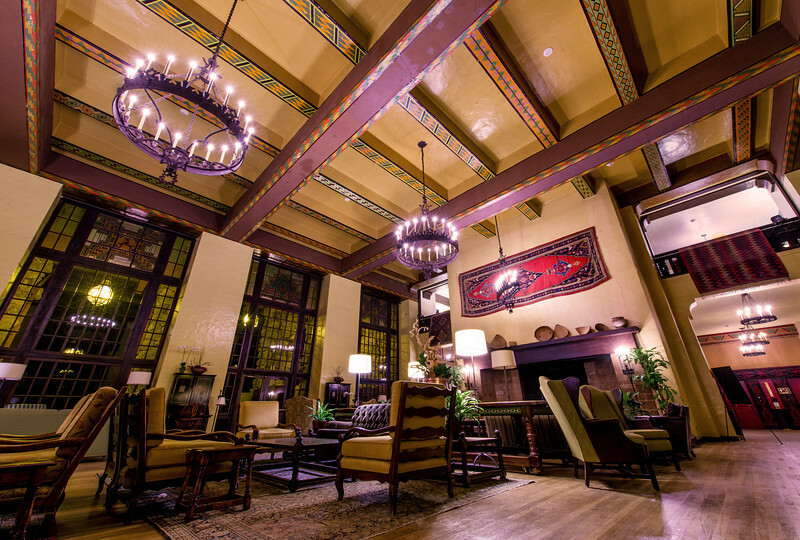 The Ahwahnee Hotel is the flagship National Park lodge at Yosemite National Park, designed with a careful blend of rustic architecture and luxury. It’s a National Historic Landmark that was designed by architect Gilbert Stanley Underwood. The Ahwahnee is located below the Royal Arches rock formation in a meadow area that was a Native American village some time ago. This spot was chosen because of its excellent views of Yosemite National Park icons, including Half Dome, Yosemite Falls, and Glacier Point. It is an excellent example of “parkitecture,” a unique style generally found in National Park lodges. I write “generally” because parkitecture has since become popular outside of the National Parks, with other companies seeking to capitalize on the popularity of this style by imitating it. If you know me, you know I’m a huge Disney fan; this new series of posts we’ll be doing called “Designing Disney” will take a look at real-world locations we’ve visited that have inspired Disney’s Imagineers. If you’re not a Disney fan, don’t worry, the references will be limited. 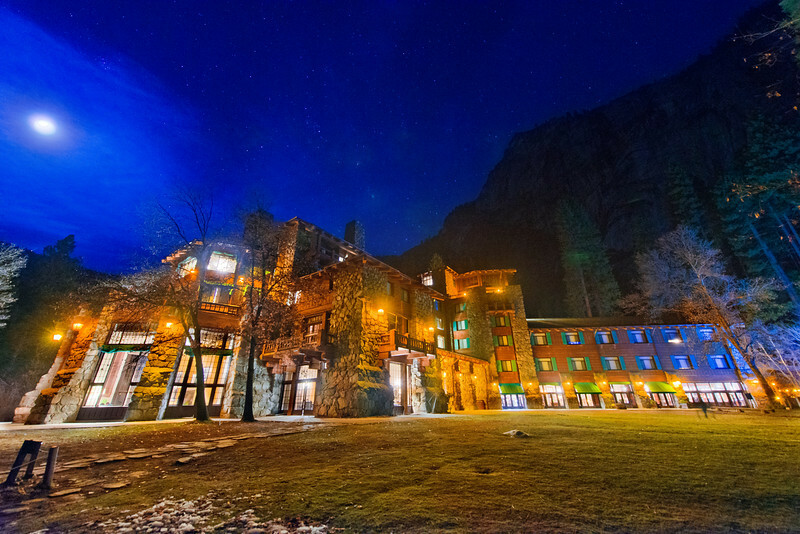 After all, this is a post about The Ahwahnee, not about Disney! The building of The Ahwahnee was a bit contentious, with Yosemite’s concessionaires (yes, plural), especially Donald Tresidder having a different opinion on how the hotel should look as compared to Underwood’s original concept art showing a massive six story version of The Ahwahnee with a cavernous lobby (I truly wonder whether Disney based its hotels more on this design than the finished product). On the opposite end of the spectrum, Tresidder wanted a hotel with only one hundred guest rooms that felt like a luxurious country home. Pretty easy to see who won that dispute. While it ended up being an intimate design, that wasn’t always going to be the case. The plans for The Ahwahnee changed at numerous times during its development. Due to these disputes, the park concessionaire was plagued with debt upon the hotel’s opening. To boost revenue during the slow winter season, they started what’s now known as the Bracebridge Dinner. 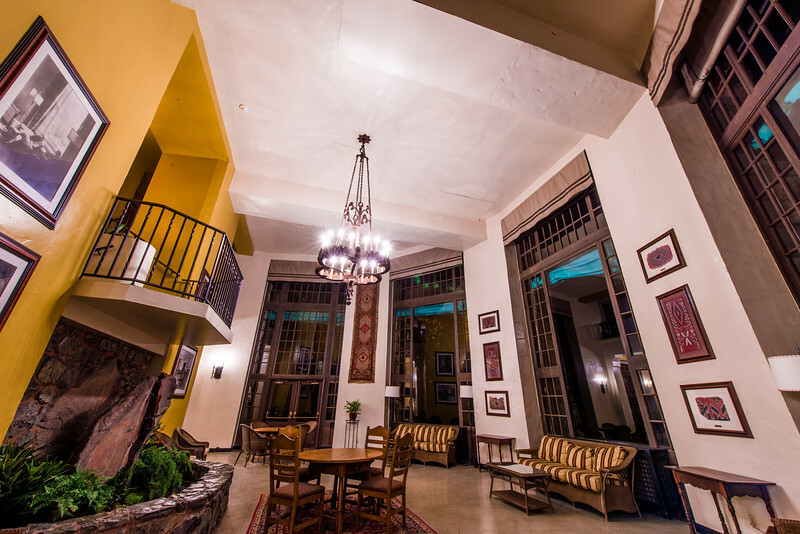 This high profile show now attracts a range of guests, from passionate locals to high society, but at the time, it was simply what was needed to keep The Ahwahnee alfoat. For many years, this high-priced event was so popular that a lottery was done to fairly distribute tickets. Oh, and an early cast member: Ansel Adams. Yes, that Ansel Adams! The Ahwahnee features a ton of Native American art, and this plus its intimacy are the basis for its charm, I think. It’s sort of like El Tovar in this regard, which is another excellent example of parkitecture. Other National Parks do grandiose better, but The Ahwahnee excels because it does feel like a home. It also has a feel of authenticity that is impossible to replicate. In general, I think this is what gives the National Park lodges their edge. Parkitecture has gone mainstream to some degree, but all other instances of it feel a tad manufactured. At their best, the lodges in the National Parks feel like they are a part of the landscape–authentic representations of the styles they encapsulate, even if those styles actually aren’t authentic even in the lodges. Here’s where the influence is most obvious. While Wilderness Lodge (check out this article for more of its origins) and Sequoia Lodge are just loosely stylized after aspects of The Ahwahnee (in my opinion, light fixtures are the big thing outside of general concept), and only touches of the interiors of the Disney hotels bear any resemblance to National Park lodges. The exterior of The Ahwahnee reminds me a lot of the interior of the Grand Californian. That might sound crazy, but take a look below…do you agree? While all of the Disney hotels mentioned are basically love letters to historic American National Park lodges, they also each bring something new to the table. I’d say Sequoia Lodge does this the best, as it gives a Frank Lloyd Wright twist to the “parkitecture” style. 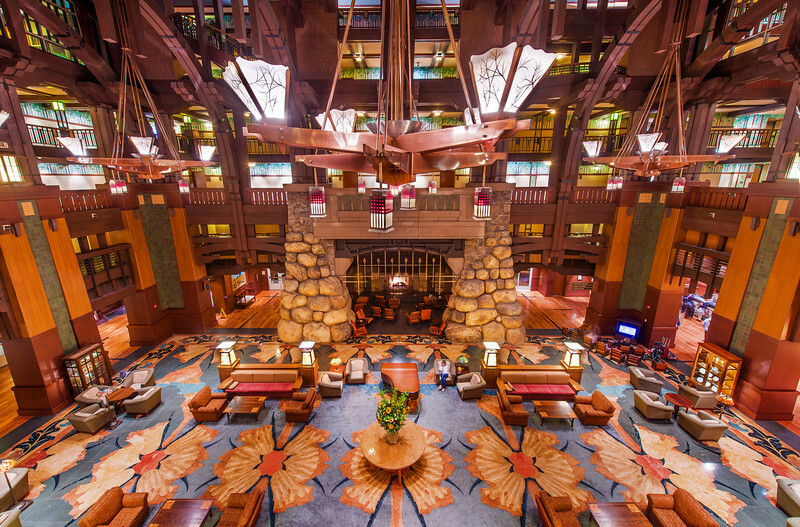 With that said, Sequoia Lodge is overall the weakest (it’s still an excellent hotel) of the three, as the grandiose lobbies of the Grand Californian and Wilderness Lodge give them a clear edge. Both are highly derivative of a slew of National Park lodges, but the elements they cherry pick from the various lodges work extraordinarily well together, and the original aspects they bring to the table also work really well. Sequoia Lodge feels more intimate and original, which I suppose arguably makes it the best of the lot. It should come as no surprise that The Ahwahnee is highly recommended. I enjoyed the hotel so much that I added it to my list of the Best Photo Spots in Yosemite National Park. If you’ve been to Yosemite, you know this is high praise, given that there are a lot of amazing photo spots in Yosemite! What do you think of any of the hotels mentioned? Do you enjoy the Disney hotels more because of their National Park influence? 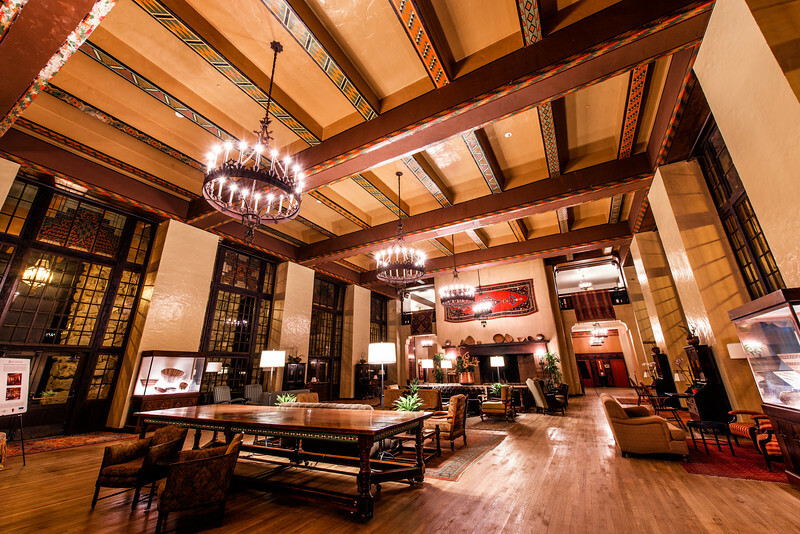 Do you enjoy The Ahwahnee more because of its familiarity? Share any questions or comments you have below! Thanks for the travel and hotel posts. I don’t get to travel as much as I’d like, and this is almost like being there! Great article! We have stayed at the Grand Californian and Wilderness Lodge. I have not been to Yellowstone nor Paris. 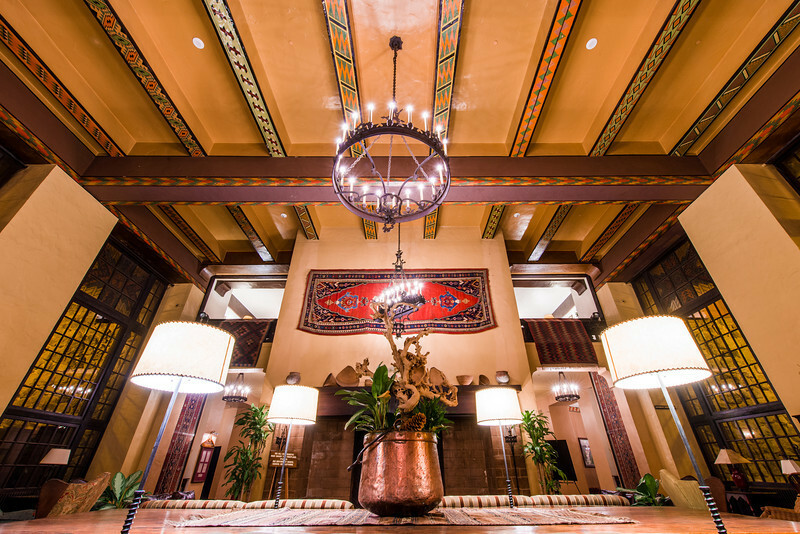 I love the Arts and Crafts style architecture of Grand Californian. Wilderness Lodge is impressive, too, with the the huge log post mapm lobby. I prefer the GC , though. I look forward to more of these articles on the inspiration for Disney resorts.